Wow. Do you ever get so overwhelmed with life that you forget the little things? That is exactly how this week has been. It was nice to have a weekend to spend with some family and forget about the every day occurances, but when you step back into the real world-you realize how much you have actually missed. This past weekend we went up to my folks to spend some time with them. It's been about a month since we have actually had the chance to sit down and let the grandparents play with the little tyke. One day of playing turned into the whole weekend. By the time we got back home on Sunday, I was exhausted and ready for another weekend. Alas, much to my disappointment, I had to get ready to start the week. Getting back to reality put me so far behind and sent me into a bit of a tailspin. Since we were gone all weekend, I began to play catch-up on Monday with my weekly grocery shopping, coming home and refusing to make anything I had just bought- settled for grilled hot dogs and chips (don't hate me). Last night, after spending my entire lunch hour beginning dinner, I finished my slaved over Mexican Lasagna, only to have my 3-year old throw a fit because he wasn't allowed to cut it up himself. After dinner I sat down to work on a paper for a class I am taking. Forget it. I wrote one paragraph and went in crawled in bed by 8:00. But here we are. Mid-Week Hump. I can see the weekend coming. I can get through this week. I will be victorious...or so I hope. My family and I decided to venture to my folks place this past weekend in which we stayed for much longer than expected. I decided to treat my folks to a good ole classic that is so easy it is scary, in addition my husband kept asking for "that chicken dip" and decided to take advantage of multiple people to get rid of the goods. Add all ingredients to a crock pot, let simmer for 3-4 hours. Thicken with cornstarch if desired. Serve with toppings and use your tortilla chips as a spoon. ﻿Let me start with a precursor. I despised egg nog until last year. Couldn't stomach the stuff. Textures can make or break a food or drink for me. Egg nog is very thick and is definitely an acquired taste. Christmas time last year, we had a couple of family members over for dinner and they happened to bring a half-gallon of egg nog. My husband jumped right to it and poured himself a glass. After several cocktails and not feeling the need to get myself anything else, I took a sip out of his glass-it was love as soon as it touched my lips. The aroma enticed me. The taste baffled me. It was a match made in heaven. To be honest I have tried multiple varieties of this from homemade, light, regular, different brands and so on. Nothing compares. 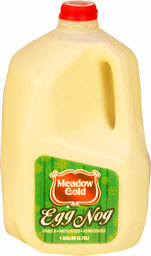 Meadow Gold Egg Nog is top notch. I am more than willing to try any other brand, or recipe to put it up for comparison but this has to be as close to perfection as you can get. Well- it was one of those days. Not wanting to cook- but definitely not wanting to go out. Instead I settled on a concoction of both worlds-sort of. One of my husband's uncles introduced us to these wonderful masterpieces a couple of years ago... and have been a hit ever since. The greatest thing about these is you can literally stuff them with whatever you have on hand, mushrooms, cheese, ham, ranch, bacon, onions the list goes on. Step 1- make patties about 1/4 inch thick and 5-6 inches in diameter (trust me they shrink to bun size) It's easiest to keep each patty on a piece of wax paper. Each hamburger requires 2 patties. Step 2- Stuff them. Make sure to keep all the fixin's in the middle of the patty and leave about 1/2 inch all the way around from the edge clear. Step 3- Put another patty on top of the fixin's. Pinch the edges together with the bottom patty. Make sure this is a tight seal otherwise you will have leaky fixin's. Step 4-Season with your favorite seasoning. I am a big fan of the Grill Mates Hamburger or Monterrey Steak seasonings if you want to go quick and easy. Step 5- Put burger into your frying pan or on your grill. One key to these being successful since they are so large is to cook them slower and longer. At the end of the cooking process, be sure to cover for a couple of minutes with a lid if it is on the stove top-just to insure it is good and cooked. Step 6- ENJOY- Throw it on a bun, add your favorite condiments, some homemade fries and fry sauce. For those of you who are non-Idahoans-fry sauce is a delightful mixture of Miracle Whip or Mayo if you prefer, ketchup and various seasonings. I use onion flake, and garlic salt. I swear if my better half could eat this every night-he would. I on the other hand cannot stand it. Every time I think about it, my gag reflexes set in. However, whenever it enters the menu... such as my husband is being particularly nice or it's his birthday it always seems to be a hit. I have adapted the recipe from good ole McCormick, but think mine is a bit more stomachable than theirs- if it is even possible- my 3-year old will eat an entire plate himself. This is a perfect meal for when you come home after work and realize you haven't taken anything out for dinner. I prefer to use frozen chicken breasts to slice thinly. They are much easier to cut, plus they don't make a sticky mess in the flour coating. Mix flour, Minced Garlic, Marjoram, Minced Onions, Salt and Pepper in a shallow dish. Reserve 1 tbs flour mixture. Coat sliced chicken with flour mixture. Heat 2 tbs of butter and olive oil in a non-stick pan on medium heat. When butter is melted and oil is warm cook chicken in the pan (may have to have more than one batch). Turn only once to preserve coating, but make sure coating has turned golden brown. As an encouraging factor, if some of your mixture sticks to the pan-it's fine. It helps the sauce later- don't worry about scraping it off. Remove cooked chicken from pan and keep warm. Add mushrooms to skillet and cook until tender about 5 minutes (the pantry was fresh out of mushrooms so I skipped this step). Mix broth and reserved flour mixture together. Add to skillet with wine. Bring to a boil while stirring with a wooden spoon-be sure to release browned bits from chicken from the bottom of the skillet. Stir in remaining butter and basil. Mix well. If sauce is getting too thick feel free to add another 1/4 cup of both the wine and broth. When butter has melted, return chicken to pan and toss generously. Sprinkle with parsley. This is great served over noodles, rice or with a side of rosemary baby reds. I've been going through recipe and recipe of stroganoff and really haven't found one to suit my fancy. I could do the good ole traditional and use a McCormick seasoning packet and follow the instructions accordingly, but that doesn't really leave much room for inventiveness. I know my better half has had quite the craving this famed simple European course for some time now. In looking in the freezer this morning what do I find but an entire stockpile of elk meat- elk hamburger-elk cube steak- and elk tenderloin. I hesitantly pull out the tenderloin in hope to make some concauction to satisfy his appitite. - As a side note, being an Idaho girl, born and raised, it is nearly inevitable that I come from hunting family. Most of my homecooked meals include wild game meat-ie elk. Forgive me if you do not believe in the whole aspect of hunting, but it is a readily available meat in my houshold and is frequently used. If you do not have access to such meats, you may substitute beef-different flavor-same concept. Just keep in mind that elk meat is extremely lean- more lean than any beef you will find. cut meat into 1 inch chunks. place in non-stick frying pan. drizzle olive oil over the top of the meat. brown both sides turning only once. season with garlic salt and pepper. add onion and garlic- cook through. add white wine and toss meat together. cover and let simmer until nearly all liquid is gone. season with rosemary and basil. add sour cream and warm through. What is our problem? Is it just me or is the 20 somethings age group becoming seriously lazy. Myself included in this accusation, I wonder what happened. My most fond memories of my childhood were all about family dinners at my grandparents where my grandmother would get up at the crack of dawn to begin the preparations. With merely one cup of coffee in her system she was a cooking superhero. Meat-check. Mashed potatoes- check. Three veggies- check. Homemade rolls- check. Dessert-check. Ever growing family- check. I would always look forward to holidays and hunting season so that we would have another delicious homemade meal where we could laugh and catch up with the extended family. Now I wonder, are our lives moving too quickly for our own good, or is it simply that we don't take the time to slow down and enjoy the small things? In my mere four mile drive home from work, I pass a total of nine restaurants. NINE! It's no wonder with their bright colors and delicious greasy food that my 3 year old would much rather stop in and play at one of these places rather than waiting for mommy to make dinner. EASY-yes. EXPENSIVE-yes, but is it more expensive then cooking from scratch at home? I have recently talked to my better half about this very question. I love cooking, but have the tendency to fall into what's easy. I want to eat healthy and make wonderful meals for my family, but at what cost? Do I spend more time in the kitchen to provide a more healthy meal than the alternative, or do I go easy so I can spend more time with the family? But at that point do I actually spend more time with them when all is said and done. With the twelve-million calories consumed after a fast-food meal, all my family feels like doing is crashing on the couch and watching a nightly sitcom-is that quality time? So here we are. Forget the fast food. Bring on the good ole home cooking. Bring back my roots. Follow in my mother's, grandmother's, and great-grandmother's footsteps. Forget the laziness. Forget the bright neon lights that lure my taste buds. Forget the extra 20 minutes of lounging on the couch in a grease coma. Here we go.